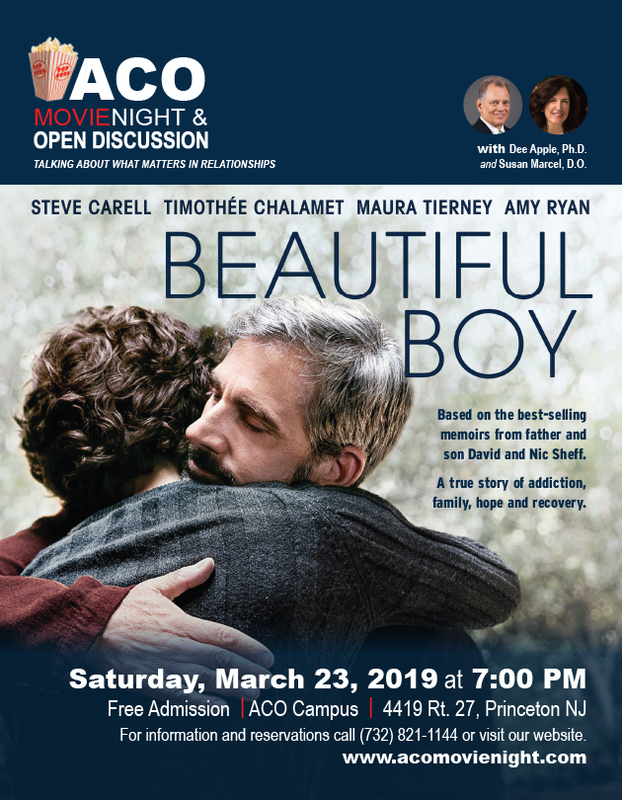 On Saturday, March 23, 2019, at 7:00PM at the ACO Campus in Princeton, NJ, ACO Movie Night & Open Discussion will feature Beautiful Boy, starring Steve Carell, Timothée Chalamet, and Maura Tierney. Based on the best-selling memoirs from father and son David and Nic Sheff, the film chronicles the heartbreaking and inspiring experience of survival, relapse and recovery in a family coping with addiction. Join us as we explore the vital emotional contact and courage needed to face the deadly disease of addiction. Dee Apple, Ph.D. and Susan Marcel, D.O. will lead the open discussion after the film.